Today I am back with another product review. 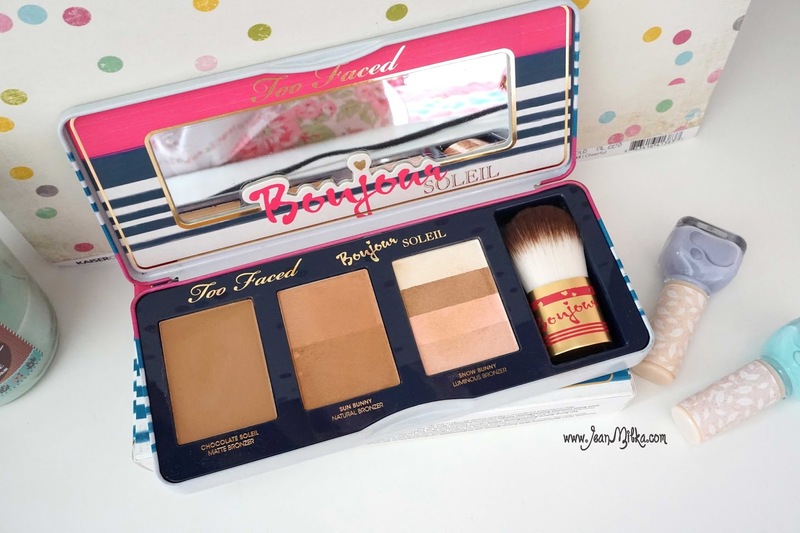 This time is Too Faced Bonjour Soleil Bronzing Wardrobe which is a limited edition Too Faced bronzer palette. 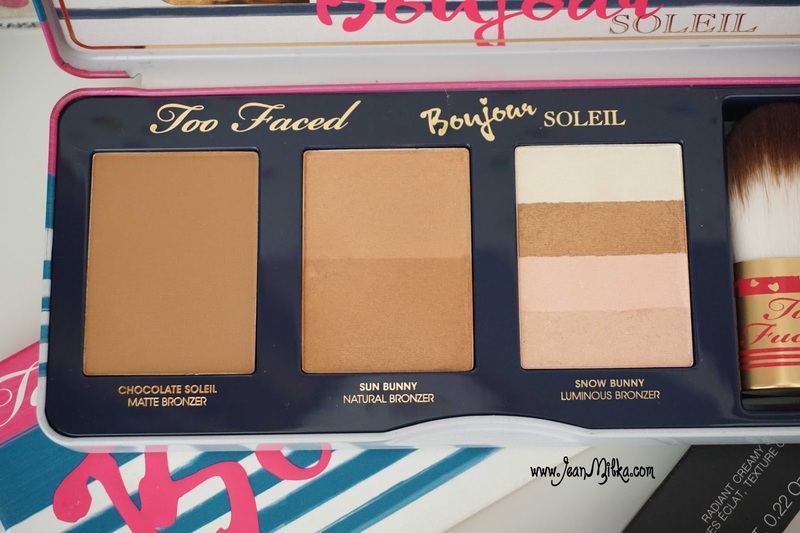 I am so happy when I knew that Too Faced combine two of my most wanted bronzer, which are Chocolate Soleil and Sun Bunny, in one palette. I wanted to get my hand on Too Faced Chocolate Soleil for so long. It is much cheaper to bought this palette compare to the individual bronzer. One Chocolate Solei bronzer cost for 30 USD or around 450.000 IDR *at Sephora Indonesia*, while Too Faced Bonjour Soleil retail for 44 USD or around 650.000 ID *I got mine for around this price from drawmyfaceid*. 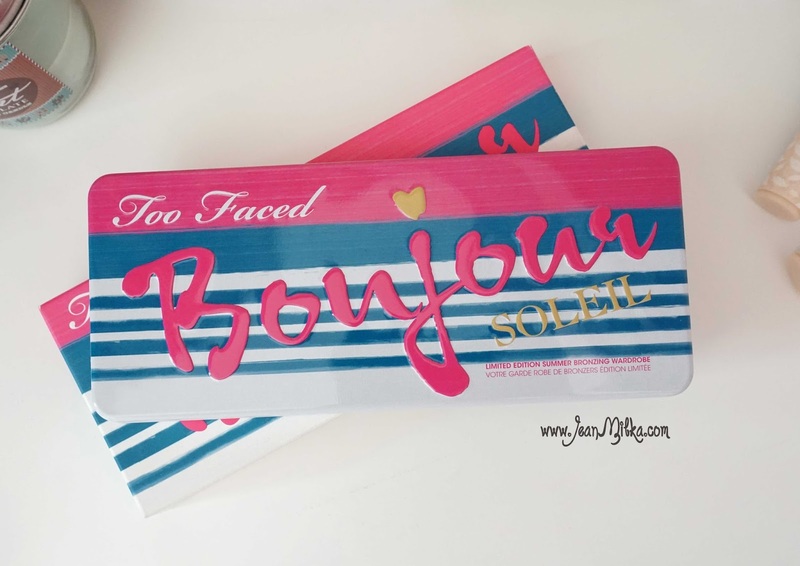 Too Faced Bonjour Soleil palette housed in metal snap shut container with build-in mirror. The container is very sturdy, even though I don't think you will need three Bronzers for a travel trip. I really love the design which is much more colorful and summery compare to the full size product. 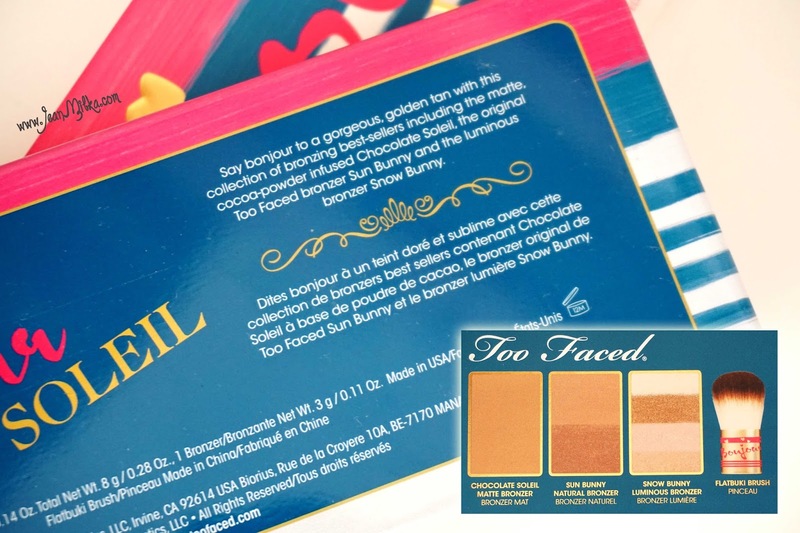 Too Faced Bonjour Soleil comes with three most popular Too Faced Brozers which is Chocolate Soleil, Sun Bunny, and Snow Bunny. Each bronzer also available in permanent collection of individual pan. All of this bronzers are "cocoa-infused" and smells like chocolate powder. I really love the scents, this is also one of the reason why I wanted to have Chocolate Soleil in past, apart from the main reason which is because of the matte finish. Too Faced also calls Chocolate Soleil as matte bronzer, Sun Bunny as natural bronzer, and Snow Bunny as Luminiuous Bronzer. Two of those shades, which are Sun Bunny and Snow Bunny, are shimmery. If you are looking for a matte bronzer than you might want to skip this one since it has prominent shimmer on two of the three shades. 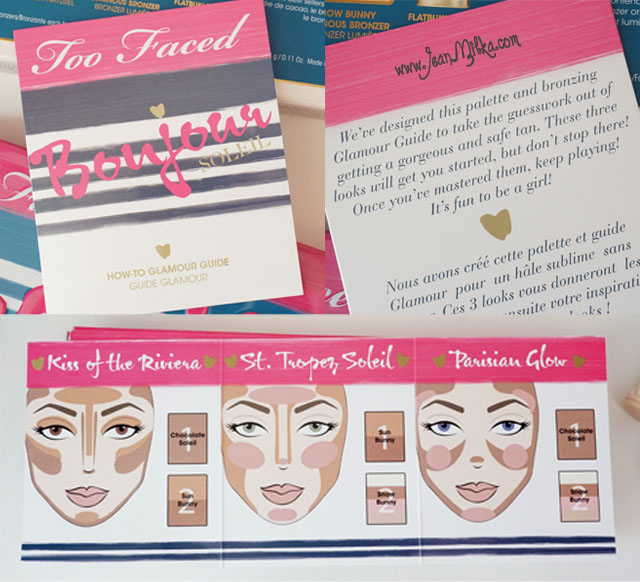 Each shade comes in size that is little less than half of the full-size product. But it will take quite a while for me to get through each color even with daily use. let's now talk more detail about the colors. 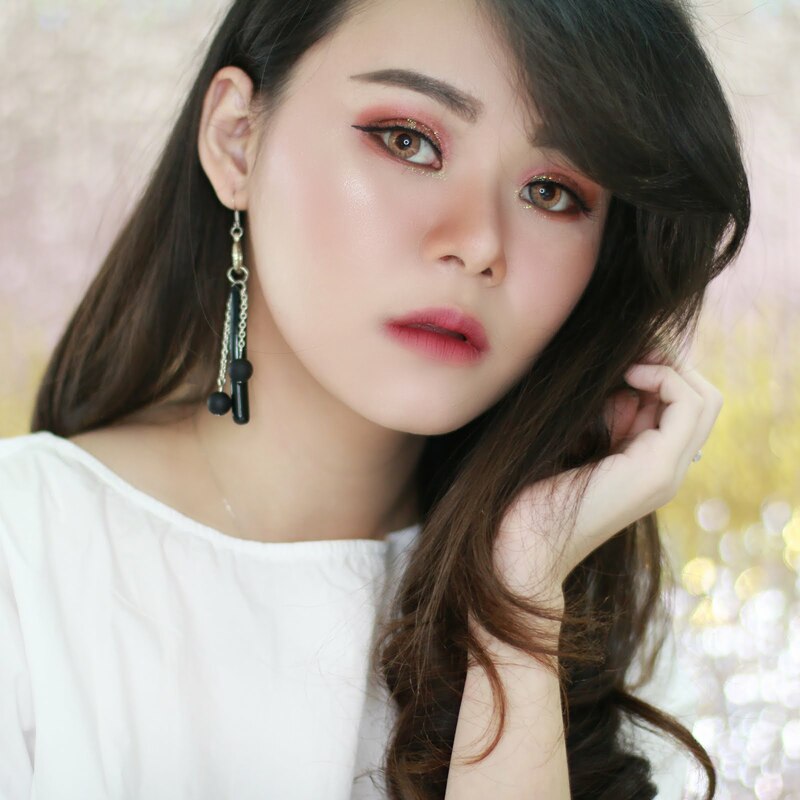 Chocolate Soleil is medium-dark, warm brown tone that is matte finish. From all of the shades this is definitely my favorite shade for contouring. I prefer matte compare to shimmery bronzer. The color is opaque in one swoop and last me for 4-6 hours before starting to fade. 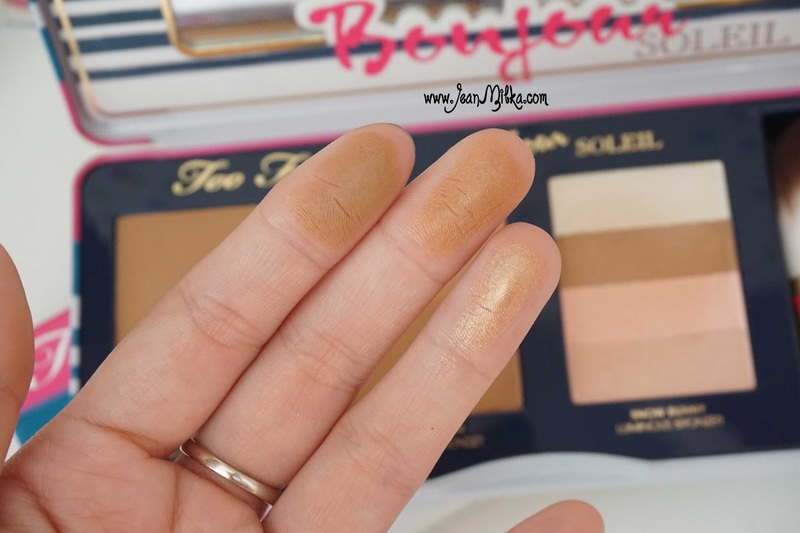 I love Chocolate soleil more than Benefit Hoola Bronzer which is also my favorite bronzer. The color payoff is great just like the pan-color. 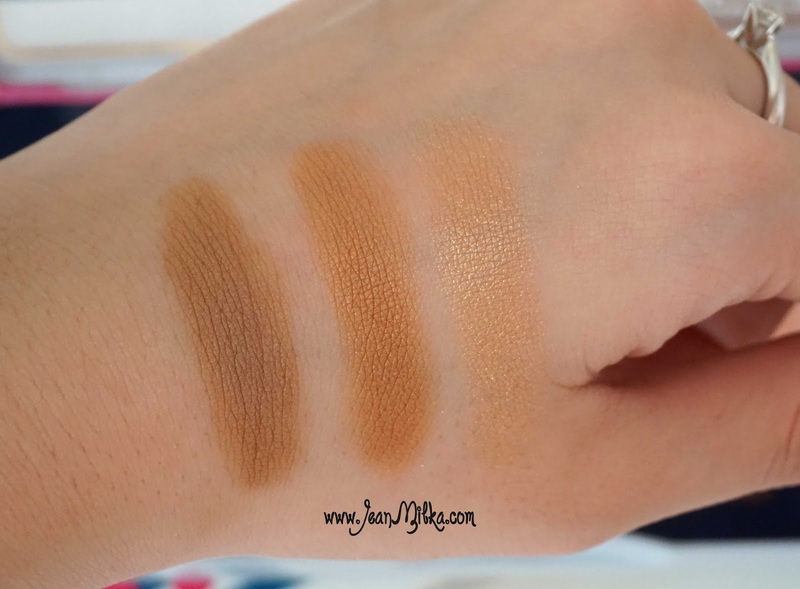 Sun Bunny describes as the slight pink undertone mimics the flush of a real tan. It is a medium-dark, orange warm brown shade with gold shimmer. From all of the shades this is the most natural shade. I like this shade for all over bronzer and do a great job to give natural summer fresh look. Snow Bunny is gorgeous 4 shades that combine for the perfect illuminating glow. This is my least favorite shade. I am not sure where I should apply this shade, but you can try the tips book that comes with this product. I love the fact that it comes with a flat kabuki brush. The brush size is as big as my palm, also match with the Bronzers size. Designed with metallic gold and red colors. 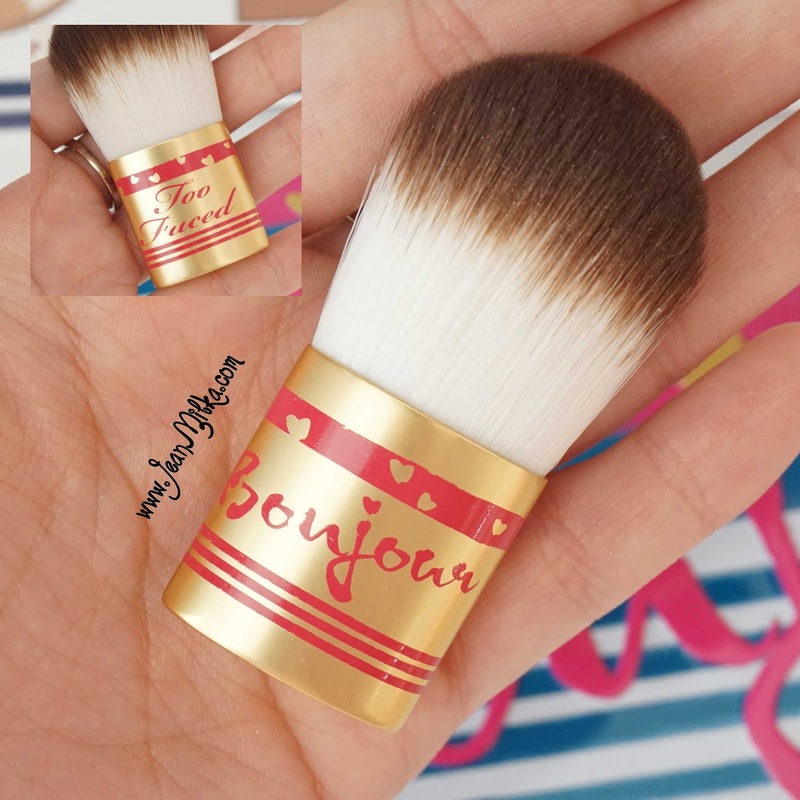 The bristle is so soft made from Cruelty-Free Teddy Bear Hair, which is Too Faced brush signature bristle. 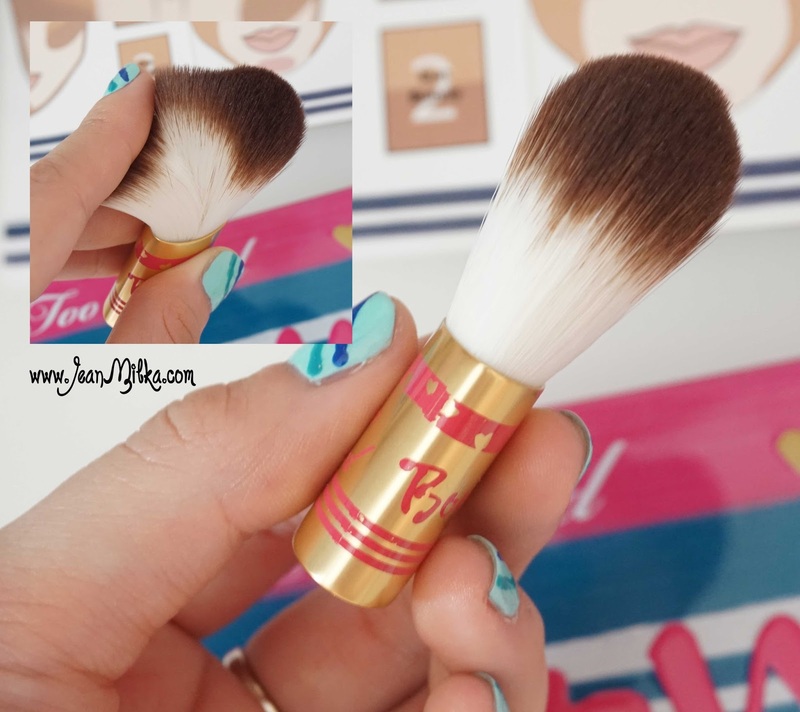 It is easy to blend the bronzer using this brush. I think it is a cool product to have on your collection. I love limited edition bronzer or blush palette. It takes years to finish one blush, that's why I love blush or bronzer palette that have more than one shades. 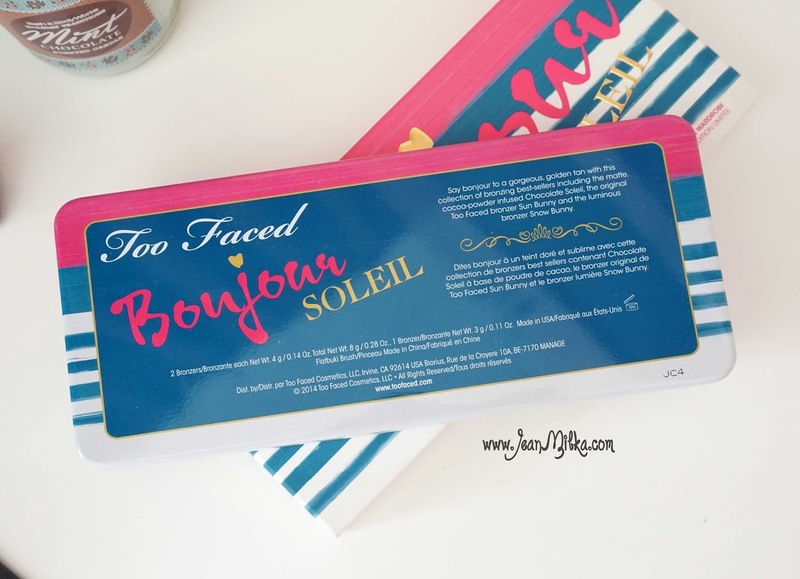 Too Faced Bonjour Soleil also comes with tips book that is very useful. It's truly a bronzer wardrobe because it gives you a lot of variation and versatility for different look. The packaging is so adorable with bright and colorful design. 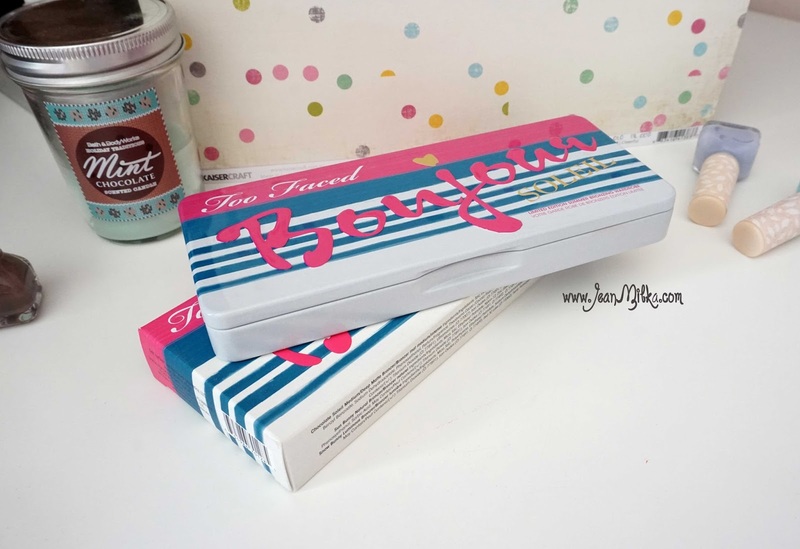 6 komentar on "Limited Edition Too Faced Bonjour Soleil Bronzering Wardrobe Review"
Yeah... worth it sich.. di banding beli satu-satu bronzer ^-^ tapi kalau nggak collect make up, mungkin lebih baik milih 1 saja.